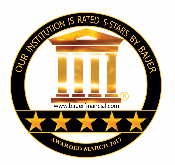 Exchange State Bank is pleased to announce they again received a 5-Star rating from Bauer Financial, an independent financial rating firm that evaluates financial institutions throughout the United States. The rating is based on a variety of factors, including the financial health and consistent operating performance of the bank. According to the bank's president and CEO, Sandra Willis, the bank has been recognized by Bauer Financial since 2007. "I'd like to recognize the dedicated staff and customer support that has made this possible," says Willis. To learn more about Exchange State Bank, visit the history page or you can contact the bank to learn more.